A long time ago, back when corrosive primers were common issue, it was necessary to thoroughly clean three times after each use to prevent corrosion in storage. This is no longer the case and hasn’t been with ammunition manufactured after World War Two. However, since the introduction of non-corrosive primers after World War II this is no longer the case. Powder fouling (“carbon”) doesn’t harm a firearm and won’t cause problems unless left to build up to the point that it physically blocks or stops the mechanism. This rarely happens. For example, some gunsmiths recommend removing the bolt from the carrier of an AR15-series only if there is a problem, not for routine maintenance. Disassembly presented in the TM (Technical Manual) *-10 is the lowest level a basic operator can go if need be. That doesn’t mean you must disassemble that far every time. 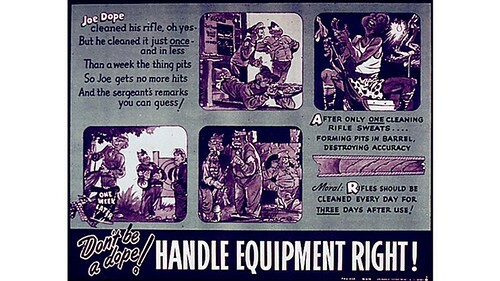 Visit http://www.armalite.com and read “Technical Note 29, Rifle Cleaning.” ArmaLite, Inc., the company that initially released the AR15/M16 rifle, recommends a “detail cleaning” (complete field strip) once every 1000 rounds and a “combat cleaning” wipe down every 250 rounds. This will change based on environmental conditions, and the fact that Soldiers may carry a weapon daily but shoot it very little. At any rate, the inventors of the M16 insist that it is important to clean properly, not totally, and that most weapons are damaged by over cleaning them. Thank you! I’m a new shooter and am delighted to get good information from a knowledgeable expert. Trying to sort through information that is just plain wrong from information that used to be true from folk wisdom from the real deal has been a challenge. I find your posts to provide a way of looking at shooting that’s based on hard fact with a dose of good old common sense. You’re hitting the sweet spot. I love it, my Bushmaster Match AR is fired every weekend (40 -60 rounds) and has not been cleaned in months…Still runs awesome. I have found that a quick daily cleanup, even after a week long CQB course,(1500 rounds plus) with an M4 not one single malfunction.